In his book Ted Haig gives a web address to order this. When I try to process the order it refuses to do so for customs reasons. Anyone have any other ideas. Other than a trip Stockholm? Dissolve, in two pints of hot tea, three quarters of a pound of loaf sugar, having previously rubbed off, with a portion of the sugar, the peel of four lemons; then add the juice of eight lemons, and a pint of arrack. 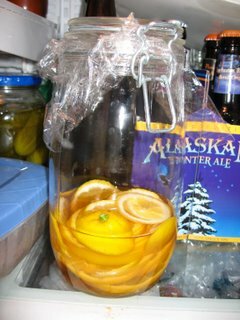 They recommend zesting the lemons (since the recipe instructions assume load sugar) and steeping it all for a few days. These are the basic ingredients for Swedish Punsch and it sounds plenty sweet enough to be right. Anyone with an actual imported bottle want to try it and compare? I'd give it a try; but, I think Arrack is even harder to find than Swedish Punsch! Maybe substitute a rum agricole or cachaca? I did see the Punch variations at Stockholm airport duty-free a few weeks ago - too bad you didn't post sooner! If you're interested in other Scandanavian drinks, do a search for glögg or glöggi, the Finnish winter mulled wine, which is made principally with wine and spices (also served with currents and almond slivers). Quite the celebrated drink in a winterland where the sun barely rises above the pines, and for that only a few hours. Thanks for bumping this back up, but I still can't find it. I'm sorry for bringing up an old thread. But, I'm from Sweden, I can send you a bottle if you really want it. A 200 ml bottle costs 67 SEK and a 500 ml bottle costs 142 SEK. I don't know about the shipping but i can have a look if you want to. Just tell me where I can find you. If any one finds anything they like on that that site ( www.systembolaget.se ) and you can´t get a hold of it, just tell me and I'll see what i can do. I bought Arrack (Arak?) in New Jersey. Pretty sure I've seen it in NYC also. The Punsch I saw and tasted at Zig Zag in Seattle but I don't know how they got it. Arak (raki) is a middle eastern liquor flavored with anise. It is similar to Ouzo. (Batavia) Arrack is a liquor originally made from distilled Palm Wine in the East (India, Sri Lanka...) Many times today a combination of fermented sugar cane and/or fermented rice are used to make Arrack. From what I've read, much of it is produced illegally and pretty nasty. Infuse Cachaca with lemon zest for a week or two and strain. Dissolve palm sugar in hot tea. Combine sweetened tea and flavored Cachaca, age for a week or two, filter and bottle. Sounds good and also easy. The only thing is, I have no idea what it is supposed to taste like. When will they get that internet taste archive going? That explains that. It shares the shelf space with ouzo. I was re-reading David Wondrich's incredibly informative, "A Brief History of Punch," in Mixologist Volume 1, and ran across this footnote. 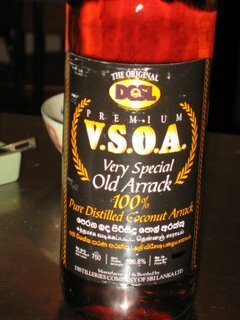 Arrack came in three main kinds, "Goa Arrack" or "Columbo Arrack" was distilled in southern India and Ceylon from palm-sap, "Bengal Arrack" in northern India from sugarcane, and "Batavia Arrack" in the Dutch colony of that name--present day Jakarta--and other parts of Indonesia and the Philippines...Originally made exclusively from rice...At some point in the seventeenth century, the Batavia Chinese took a leaf from the Bengalis and began making Arrack from sugarcane, although they retained the traditional Chinese technique of jump-starting fermentation with little cakes of moldy red rice. In addition in Stanley Clisby Arthur's "Famous New Orleans Drinks & How to Mix 'Em", I find the following information from his writeup of the Arrack Punch recipe. Arrack is the fermented juice of the date palm, and is a name that was applied in Eastern countries to any spiritous liquor of native manufacture, especially ones distilled from the fermented sap of the coco-palm, or from rice and sugar fermented with cocoanut juice. Later the arrack imported from Batavia and Japan was considered superior in concocting the punch, at which time the name arrack was shortened to "Rack". These two quotes lead me to wonder if the most appropriate substitution for Arrack might not be some decent Japanese Shochu or even Chinese liquors started with "Red Starter". Perhaps a trip to one of the many Asian Grocery stores in the area is in order. Who knows, they might even have Indonesian Arrack. Though, given what I've heard about the flavor of Chinese rice wine and liquor, it is probably no wonder it was heavily adulterated before being consumed. I recommend looking through Google Books for old information on Arrack. There are a few old definitions of Arrack. In some old newspaper cuttings, it seems that Arrack from Goa was highly thought of by the British. And one would assume that it was the original Arrack to be used in Punch. Batavian (Jakartan) Arrack may have taken over in the US, from Goan Arrack, for reasons other than taste, but do you know specifically? Having done some field research on Chinese distillates, I would recommend NOT trying this. First off, the flavors are completely different; the only thing Batavia arrack and Chinese distillates share is the uniquely volatile and permeating nature of their aromas. But the Indonesial (Batavia) arracks I've tried are really rums, albeit funky ones. The best substitute I know is the Wray & Nephew white overproof rum from Jamaica. The Chinese liquors I've tried are emphatically not rums, and are indeed an acquired taste (and that's putting it politely). They're the limburgers and Epoisses of the spirits world. An excellent article is Lars Frederickson's "The Liquor from Luzhou and the Secret of the Earth Cellar"; I'd give a link but right now the only thing that's working is Google's cache of it. I think the Goan (coconut sap or "toddy") arrack was indeed the original kind used for Punch, but by the 19th century it seems to have fallen out of favor; at any rate, I've only found one reference to it being imported to the US, as against many for Batavia arrack. One possible reason is that it was (and still is, judging from the Sri Lankan variety) much weaker than the Batavia kind, and hence needed to be used in large quantities. Since shipping costs made arrack the most expensive of liquors, this would have Batavia arrack, which was--and is--potent enough that only a little will flavor a punch, a much more attractive proposition. Is there any record of how the Batavians drank their Arrack? Was the Batavian Arrack straight-swapped for the Goan Arrack simply because of the shared name, or was it also consumed in a punch type beverage? Which country was the colonial master of Indonesia at the time? was it the Dutch? Could an anti-English colonial product embargo have been in place, if not officially then culturally? The kindness of Canadian bartenders (Thanks Darcy!) has allowed me to come into possession of some Sri Lankan Arrack. As Darcy O'Neil described on his website, The Art of Drink, Arrack is pretty odd tasting stuff. I was surprised it was as smooth as it is. I was expecting something much closer to Wray and Nephew White Overproof. I really don't know what to tell you it tastes like. Some of the flavors remind me more of whiskey than rum. Others are completely new to me in a distilled spirit. I have attempted to turn it into something like Jerry Thomas' United Service Punch. Revisiting today, I seem accidentally to have crossed the United Service Punch and Imperial Arrack Punch recipes. Take ½ pint of Arrack. 1 pint of Jamaica rum. 3 pints of hot tea. Rub off the peel of four of the lemons with some of the sugar. Dissolve the sugar in the tea; add the juice of all the lemons, and the Arrack. Serve cold. Take 1 quart of old Batavia Arrack. 1 quart of boiling water. Cut the lemons into thin slices, and steep them in the Arrack for six hours. Remove the lemons without squeezing them. Dissolve the sugar in the water, and add it while hot to the Arrack. Then let it cool. This makes a fine liqueur which should be thoroughly iced before serving. I'm not sure about amounts for the liquids, since I have no idea what proof liquors Thomas might have been working with. I decided to shoot for something around 20% alcohol, since this seems to be where I see most Swedish Punsch listed. Trying to halve the recipe above, I steeped 1 thinly sliced lemon in 1/4 pint Arrack and 1/2 pint Rum overnight. I made a cup of darjeeling tea, dissolved a cup of demerara sugar in it, cooled to room temperature, (the reason to cool to room temp before chilling is tea tends to cloud if chilled too quickly,) and chilled overnight. In the morning I strained the alcohol mixture (not squeezing) and combined it with the tea syrup. 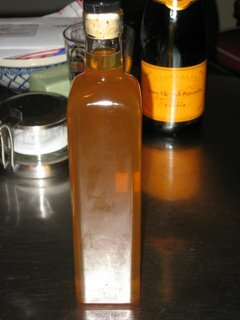 12 hours later, I ran the barely aged liqueur through a filter and bottled. The result isn't a bad tasting liqueur. A bit odd, it must be admitted. Still, tasty. No idea if it is remotely similar to real Swedish Punsch. But, that won't prevent me from making a Biffy Cocktail with it! You're right and a bit wrong. Apparently a word similar to "Arak" means something like "distilled wine" in Arabic and can be used to refer to any distilled spirit. There is no connection, beyond both being distilled spirits, between Sri Lankan Arrack and Lebanese Arak. Sri Lankan Arrack is distilled Palm Wine. That is to say, palm trees are tapped, the sap oozes out, it is allowed to ferment, and then it is distilled. The resulting alcohol is kind of similar to rum and/or tequila. Though, it is often made illegally in both Sri Lanka and parts of Africa, and may or may not involve 100% palm wine. Lebenese Arak is usually (though not always) based on distilled grape wine and is most often flavored with anise seed, making it a bit similar to Ouzo and spirits like that. 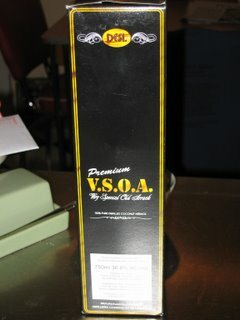 Batavia Arrack is from Indonesia and based on sugarcane, making it a bit similar to rum. However, instead of yeast, a fermented red rice is used to start the fermentation of the cane, giving it a unique flavor and smell. After posting the above, I did finally get to try some real Batavia Arrack and Swedish Punsch, and realize the punch I created had little to do with real Swedish Punsch. On the other hand, it's closer to Swedish punsch than any other rum substitution I can think of. i made a good one six months ago and upon rediscovering it found it aged really well. to me rum punch is all about creating a new spirit with as much depth of flavor as you can before it turns into fruit mud. the flavors should be expressive rather than integrated and roll across your tongue.... think new zealand sauv. blanc. and not meursault. anyhow you gotta calculate mathematically how much volume of juices, tea, sugar, acid, etc. you can add to bring the rum down to your desired proof. don't quote me but i think a 750 of 151 comes down to the 70's after adding 2.2 cups or so. a couple things go in but alot comes out. This seems like as good an opportunity as any to re-ask: Is there still no online source for real Swedish Punsch? I haven't had any luck trying to contact the folks at The Northerner, though, I've never tried phoning. I guess I'm not that excited about paying what I imagine will be exorbitant shipping charges, otherwise I would try harder. Erik, how do you mean "contacting the folks at The Northerner"? It looks like they're set up as a straight e-commerce site, and you should be able to order their Carlshamns Flaggpunsch Original online and have it shipped directly to you. When I did a dummy purchase they seemed to be charging around 14 bucks a bottle. So 35 bucks for a bottle of Swedish punsch isn't cheap, but it would be nice to have around. When I tried it a couple of months ago, it went through and I got a confirmation and it charged me and everything, but when I checked the status on my order (thinking it too good to be true) it said out of stock or something like that. When I sent a query as to when it would ship they came back saying that they cannot ship to the US for customs reasons, and my money was promptly refunded. What we need is a similar site in English without as much concience about smuggling. Evidently this site was working in 2004. As far as the cost goes, if I recall correctly, I ended up paying about $20-25/bottle when I ordered two (with shipping and everything). Expensive, but hardly exorbitant. Yes, you can add it to your basket. However, when you try to go through the checkout process, the punsch will be removed from your basket, "due to customs reasons". Or at least that's what has happened the last few times I've tried. I sent them enquiries using their online feedback system, and they've never replied.